Mythology gets modern in The Penelopiad, Margaret Atwood’s alternate take on Homer’s Odyssey epic. Based on the 2005 novella of the same name, this pitch-black comic tragedy at Hart House theatre examines the life of Penelope, famed for holding court at Ithaca in her husband Odysseus’ twenty-year absence. In this version of events, she is much more than a dutifully waiting good wife. When it comes to performances at Hart House, I hardly have to worry about having a visual feast, and this show was no exception. Holly Meyer-Dymny’s set invoked the isolated, nautical aesthetics dwelling at the heart of Penelope’s story, while also painting an ethereal and otherworldly ambiance. Despite the performance’s whimsical and fable-like setting, it talks to modern sensibilities, re-examining what we think we know about this enduring legend. Putting a modern, feminist spin on ancient folklore isn’t a new game, but it is invigorating to see what storytellers of today interpret from classical tales. Atwood shines a light on characters that have been historically sidelined, and the result is a damning look at gender, politics and war from then and now alike. The script is a dynamic and feeling dive, using the slave girls of Ithaca as a traditional Greek Chorus. It ties the structure of Ancient Greek theatre — where the art form effectively began — with the play’s otherwise contemporary take on language and dramatic structure. It’s a brilliant link between past and present, while also giving a voice to women who would otherwise have none. And in a sharp inversion of traditional theatre rules, the cast is entirely women. It brings into focus the way women view men, and vice versa, and the hardships that result of it. That is not to say that the script always strikes gold in its revisionist feminist theory. Helen of Troy is depicted as remorseless narcissist to blame for Penelope’s lot in life. It gives our heroine a fatal flaw, but her perspective seems petty and needlessly cruel. Similarly, with clever Odysseus’ talent for deception and lies, this version of events asserts that his famous journey was largely fabricated. It’s a bold statement, but hampered by the repeated references to his captivity on Calypso’s island. The backbone of this play is in using a present-day lens to unpack ancient lore, and by those very standards, Odysseus would be considered a victim of wrongful imprisonment and sexual assault. Instead he is treated as an unfaithful husband who cruelly prolongs his wife’s predicament. These characterization choices, whether they are inherent of the text or a performance choice, seem like a failure to engage with the play’s own premise about power structure and abuse. However, the script is not that old, and was written by one of the most influential Canadian writers alive, so it is understandably difficult to change the text, subtext or meaning in some places. Without prior knowledge of Greek mythology, audiences are left to take Penelope’s account at face value, and her reliability as a narrator is, like all mythos, a subjective matter. That said, the cast and creative team still approach the work with a careful, humanist touch. Amanda Cordner’s performance of Penelope is commanding, and carries the show with a layered and graceful delivery. She is wise but candid, enduring but regal, and witty but morose. The complexities of her many roles – queen, mother, daughter, wife, victim, savior and conspirator – are all visible in her motions and words, each trait flowing through her like the water that defines the fable. 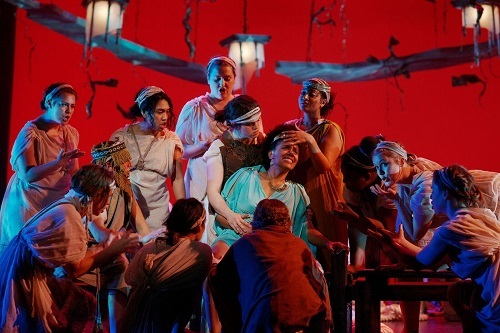 The girls of the chorus do much more than fill the stage for her, playing the maidens with sympathy and sliding into dual roles such as the predatory suitors and other famous characters from lore, creating an all-too-real image of what was, and is, at stake for women. What I appreciate the most about The Penelopiad is allusions to modern-day politics are not obvious. Instead, they let the work speak for itself and audience members are free to draw their own conclusions. It is rare but rewarding to see a work that successfully empowers the empathy and critical thinking of its audience. Since this is a story about survival, we require both. Photo of cast ensemble by Scott Gorman.